Oregon third-grader Kyron Horman has not been seen since Friday. (CNN) -- The search for a second-grade student who disappeared last week after he arrived at his Portland, Oregon, elementary school intensified Monday. 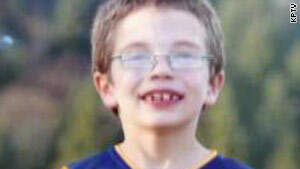 Kyron Horman, 7, did not return home Friday from Skyline Elementary School, police said. According to investigators, the boy's stepmother said she last saw Kyron on Friday morning while he was walking down the hallway toward his classroom. "There was a science fair here at the school," Portland Public Schools spokesman Matt Shelby told CNN. "You had a situation with lots of parents and friends coming through the school, going class to class." "Kyron was here with his stepmother, seen with his stepmother," Shelby said. The science fair was held before the beginning of classes, Shelby added, "so working parents could come and participate." The Multnomah County sheriff's office reported that no one at the school saw Kyron after 8:45 a.m. Friday and that the child never made it to his classroom. Searches in the school area were conducted Friday and over the weekend by several agencies, including the Portland Police Bureau, Gresham Police Department, Fairview Police Department, Oregon State Patrol, and the FBI. Authorities have also utilized Portland Police Bureau's air unit in an attempt to locate the child. "My heart, and the hearts of everyone who is a part of Portland Public Schools, goes out to Kyron Horman and his family," Superintendent Carole Smith said in a written statement. "We are all wishing for Kyron's safe return as quickly as possible and we are grateful for the efforts of all the law enforcement agencies who have worked so tirelessly over the past 48 hours to determine the cause of Kyron's disappearance, locate him and return him safely home. "The reported disappearance of a student from one of our schools is unprecedented and deeply troubling. Portland Public Schools is doing everything we can to assist the authorities in their effort to find Kyron." Counselors have been made available today to children and teachers at Kyron's school, Shelby said. "Our focus is on supporting the students and staff," he said. Anyone with information on Kyron Horman's whereabouts is asked to call the Multnomah County Sheriff's Office at 503-261-2847.